2) actualy: system macro "expression *"
thanks. Do not be angry, my english bad. 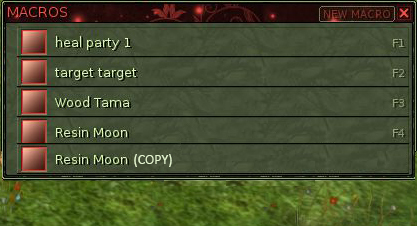 Macros are located in Ryzom/save folder in keys_<char>.xml. 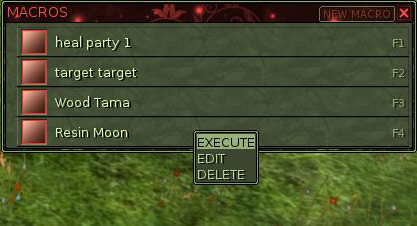 You can edit it in any text editor and copy/paste commands. You do need to take care of increasing "id" field ofcourse, so make backups incase game finds errors. True, but I think that that might be because making a macro with all the possible permutations would be a bit labor-intensive if you edit the .XML and outright tedious to do in-game. I think that this might be a handy little time-saver, especially for those who aren't prone to opening up their editor of choice as a reflex action. macro duplication is now added. For /target, it would make sense to change it from "starts with" to "contains" ("/tar yubo" for example). All the current uses should still work with new rule.